It's good to see Alesis back in the electronic drum saddle with a product that does the name justice. Those expecting a champagne experience on relative beer money might be (unjustifiably) underwhelmed, but the DM10 hits the mark where it counts, making it worthy of serious consideration. It's a physically bigger kit than those typically offered by other big brands at this price - perfect for long limbs. Inclusion of Surge Cymbals and RealHead pads. USB connection. The hi-hat pedal is 'plasticky'. Back in the '90s, Alesis dominated the affordable studio effects market with products like the Quadraverb and MIDIverb. But it was the ubiquitous little SR-16 drum machine that was of more interest to beatmakers - a great-sounding little box that, remarkably, you can still buy new today. The intervening years haven't always been easy for the brand and its electronic drum set offering, what with bankruptcy in 2001 (after which Alesis was rescued with a buyout by Numark) and a subsequent reliance on the somewhat outdated DM5 drum module. "Alesis should be applauded for the simple USB approach to linking with the outside world." While the DM10 brain is largely what all the fuss is (understandably) about, the DM10 Pro kit's rack system is clearly key to its success or failure in use. To give the metalwork its proper name, the ErgoRack is a simple design, with a single curved front bar linked to two straight legs and three 'wings' (two on the left for the module and hi-hat, one on the right for pad number three). After a couple of months dominated by top-end launches from Roland and Yamaha, the straightforwardness of the Alesis rack marks something of a change from the typically curvy bespoke rack units sported by the DTX and V-Drum range-toppers. But there's a modest honesty about the ErgoRack that's quite appealing - the fanciest thing about it is its name, in fact. Familiar clamps hold together decently-finished chromed tubes and, although there is rather a proliferation of drum-key operated fastenings, once everything's in place it's all rigid and perfectly serviceable. You might spend a little longer fettling a rig like this to get everything to sit where you want it, but once you're there, it's a nice place to sit. There's certainly plenty of space thanks to the generous width of the front bar and, although we wouldn't want to overload the basic rack, there's certainly room for additional pads and cymbal holders should the need arise. 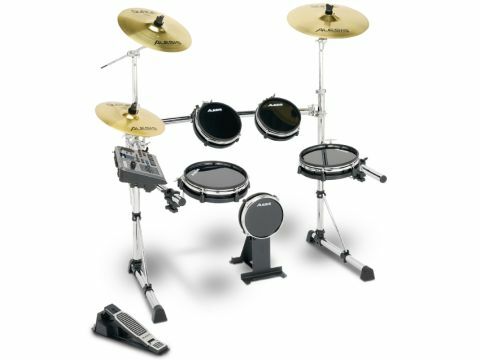 The DM10 is triggered by means of a quintet of Alesis RealHead pads and three Surge cymbals. The RealHeads (a pair of 8" for the 'high' toms and 10-inchers for the snare and 'floor' tom) are nicely built and the shiny black playing surface looks cool and seems to wear well too. In terms of feel they're forgiving, if perhaps lacking a little of the squidgy tactility of rubber or the softness of mesh, but there's no cause for concern in terms of jarring or 'table-top' response that pads of yore displayed. The Surge cymbals most recently appeared in these pages alongside the Jobeky Prestige kit and I expressed my liking for them then. Surges are alloy cymbals with built-in triggers that deliver some of the feel we're used to from traditional instruments but with none of the volume. And finally to the new brain. A total of 1047 sounds are contained within, the 16-bit uncompressed samples including a choice of 85 snares, 28 rides and 69 toms among myriad other percussion and electronic sounds. And Alesis are quick to highlight the DM10's USB connectivity, which allows new soundsets to be installed, and external software to be triggered with ease. Another aspect of the DM10 the company makes much of is its Dynamic Articulation feature, responsible for what it describes as the changing timbre of sounds as playing velocity varies. In plain English, Dynamic Articulation is supposed to make the DM10 feel as much like playing real instruments as possible - sounds don't just get louder as you hit harder, they change character. In practice, it's certainly the case that the multiple layered samples deliver pretty decent approximations of acoustic drums (where applicable). "Those expecting a champagne experience on beer money may be underwhelmed, but the DM10 hits where it counts." Given the DM10's affordable price tag it's unfair to expect the kit to serve up the kind of organic, super-sensitive response that current top-end kits can summon, what with their ability to sense stick position on the head and all. But the DM10 is miles better than its forebears in this regard and steers clear of crass machine-gunning. We found that a couple of minutes' tweaking paid dividends when looking to maximise the 'natural-ness' of the DM10's tonal output. Often a quick reduction in reverb, and a light opening up of the top end of a snare, for example, breathed a welcome degree of airiness into proceedings. Not that the factory sounds are unusable, by any means, but a tad of personalisation is never a bad thing. In fact, taking this approach illustrated the ease with which the DM10 allows editing - to start with, the manual stayed in the box while we quickly worked out a route into the tweakable parameters for each pad. The hands-on appeal of the DM10 is extended with the mixer panel that dominates the unit too. Quick and easy altering of individual volumes helps make this an instantly user-friendly box. Again in deference to its price, it's fair to acknowledge that we won't be treated to a stand-mountable virtual hi-hat with the DM10. Instead, chick-chick duties are down to the familiar, slightly plasticky pedal and, with the best will in the world, this is never going to result in the most buttery-smooth feel. But a little work to 'dial-in' with the pedal pays off and the combination of well-chosen sounds and a delicate left foot goes a long way to a happy enough hi-hat experience.